On 23 October 1976 twenty collectors met at Corsham Court in Wiltshire to discuss the possible formation of a Society to satisfy the needs and capture the enthusiasm of a growing number of magic lanternists. By the end of the second meeting, at the Stanhope Institute in London in January 1977, a formal constitution had been drawn and the pattern of quarterly meetings was established within that same year. The Magic Lantern Society of Great Britain had been launched. Our first International Convention was held at the Architectural Association in London in 1983 with 150 delegates - all members of the Society - attending. The Convention included the largest display of magic lanterns ever assembled. This was the time when the transition was made from being a Society for the enthusiastic collector to a professional body with credibility in the outside world and a reputation to maintain. Almost overnight the quarterly meetings took on a different meaning - numbers attending rose substantially and expectations of the programme became more demanding. In 1985 the Society was invited to France by Club de la Lanterne to participate in the annual photographic fair held at Deuil-la-Barre, a northern suburb of Paris. This wonderful event was to be the first of many overseas meetings. The Society changed its name to The Magic Lantern Society in 1991 in order to reflect its increasingly international membership. The Society's commitment to research has manifested itself in the publication of not only a quality quarterly journal but also authoritative monographs at regular intervals. The New Magic Lantern Journal was launched in 1978 and the Society's reputation grew with it. The journal became the flagship of the Society, distributed worldwide to libraries and museums with an interest in the projected image, as well as being enjoyed by our members. From 1980 we also published a quarterly Newsletter as a vehicle for informal communication between members. Over the years, each editor has skillfully complemented members' contributions with original material and rare ephemera. These publications were superseded by The Magic Lantern starting in December 2014 and in that same year we launched a free monthly e-letter New Light on Old Media . Most of our publications appeared to coincide with our International Conventions; the first, The Ten Year Book published in 1986, was a ten-year celebration volume for the Society containing a variety of articles. Our publications reflect our members’ expertise and interests, and support the Society’s main aims. Many of our publications are still available for sale. In this digital age the Society, always mindful of its international membership, looks to technology to enhance its membership offer. We are reaching new audiences via social media (Twitter and Facebook) and working hard to realise our ambition of digitising our resources. There is still much to discover and much to enjoy. 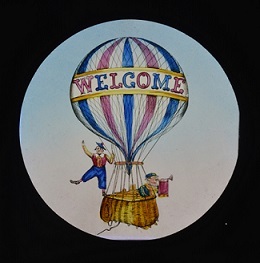 Above all we will continue to put an emphasis on the preservation of the art of the lanternist for the enjoyment of the lantern show audience, the conservation of optical magic lantern media and collections, and the great community which our members bring to this, their Society.